Weddings at Caldicot Castle at Caldicot Castle and Country Park Wedding Ceremony VenueYour fairy-tale wedding venue awaits you here at Caldicot Castle. Our dedicated team will work with you every step of the way to fulfil the wedding of your dreams. For over 900 years the magnificent spectacle of Caldicot Castle has dominated the landscape. Set within 55 acres of parkland overlooking the river Nedern, Caldicot Castle is an ideal setting for your wedding day. We invite you to hold your wedding ceremony, reception and evening celebrations in our unique surroundings. Whether you are planning an intimate gathering or larger celebration, we are sure that our magnificent courtyard and our charming gatehouse banqueting hall will not fail to impress. A blend of heritage and splendour will make your day one to cherish and remember forever. We do however realise that your special day should be as unique as you are. 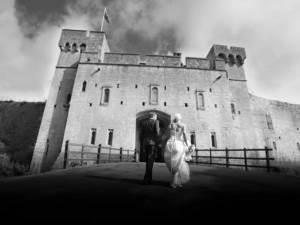 We would therefore be delighted to discuss your individual requirements and budgets in order to ensure that Caldicot Castle is your first choice of wedding venue. Our magnificent Castle, courtyard and parkland will make the perfect setting for your wedding day. An exciting blend of heritage and splendour will make your day one to cherish and remember forever.